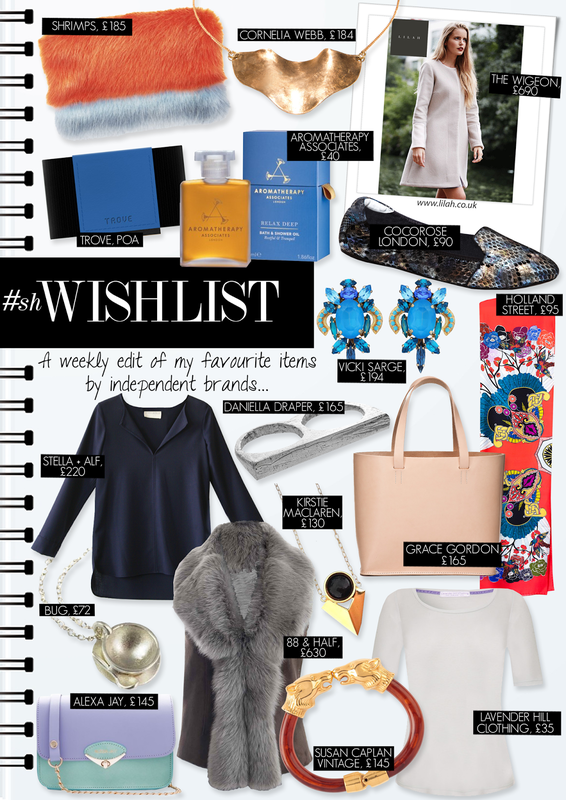 NINETEEN - The #shwishlist - A weekly edit of my favourite items..
Over the last few months I have been very busy working with my clients on lots of exciting plans. When I am able to let loose on the details I will share everything with you all. Most, if not all of my clients are British brands who made a commitment to themselves and their customers to make their products in Britain. A few weeks ago I attended the launch of 'Best of Britannia's' new initiative ‘Buy British Day’, at the House of Commons, which will take place this week on Friday 3rd October 2014. The aim of Buy British Day is to encourage consumers to not only buy British-made products but also for us to ask ourselves questions about the benefits of being manufactured in Britain. To keep up to date with all the news and to join in the conversation, use the hashtag #BuyBritishDay and follow @BestBritannia on twitter. My #shwishlist features fundamentally British owned brands and as much as possible I try to find labels who manufacture in Britain too. However, despite being passionate about promoting made in Britain brands, the reality is we have a depleted skill set within the British manufacturing industries. Unfortunately not all brands are able to encompass this into their brand at present. I think it is vital to support brands who are not (yet) made in Britain, but owned and based here, for the future of their brand, their employees and for our countries economics. We hope that with this support and when the time is right for them these brands will develop a viable made in Britain approach. In the meanwhile shift your attention to the brands who painstakingly produce their products in Britain and let's celebrate their efforts on Friday. I am so pleased to have found my latest selection of covetable brands. Holland-Street create beautiful printed silk loungerie - and yes I did mean 'loungerie', I haven't spelt 'lingerie' wrong - Pieces include kimono-style gowns, robes, kaftan-style nightgowns, scarves and eyemasks. The brand was named after the street where founder and designer, Lauren Barfoot, grew up. A thoroughly made in Britain brand, at Holland Street even the fabric is sourced and made in the UK. I must admit with my textile fashion degree I often focus on surface pattern design. I am thrilled that prints, pattern and embellishment are now a foundation of our style. At Holland Street the brands ethos is based on textiles which undeniably shows within the pieces. I love the innovative floral prints, designed in house. It is clear that Lauren knows exactly how to use print in fashion especially considering her impressive history. Not only did Lauren train at the RCA but also after graduation was print designer for Zandra Rhodes. To see Holland Street's 'Poppy Red Scarf' featured above click the link at the bottom of the page. Susan Caplan Vintage is a special brand because it allows beautiful jewellery a new home and cherished owner. I have always loved vintage jewellery, regularly wearing my Grandma's pearls and scouring antiques fairs for jewellery which came with an untold history from another era. My first vintage Chanel bracelet was first discovered by Susan Caplan and team, bought by my best friend in 2008. Since then the brand has developed and is now stocked in some of the UK's most loved luxury department stores. If you're looking to add a hint of old-Hollywood to your evening attire, look no further than this trusted vintage label. For some of you, Shrimps, the fashion faux-fur brand will need no introduction. London based Hannah Weiland launched the playful label for the Fall 2014 season. At fashion week EVERYONE was wearing something from the collection. Featuring bright colours and a contrasting Breton stripe, the fluffy sixties looking coat is unmistakable. Another fabulous feature is that the brand only uses faux-fur, allowing everyone an opportunity to enjoy it. My first foray into the sweet world of Shrimps is through their 'Pablo Clutch Bag' which I happily carried this fashion week. If you are looking for something to stand out in this season, Shrimps is the label for you! Another brand which is one to remember for the season ahead is Lilah. Inspired by classic designs, Daisy Fellowes creates timeless coats and jackets that are perfect for so many occasions. I found the label when I was researching for outfits for a client of mine attending Ascot. A year previously I attended the brands launch and took photos of the clothes on mannequins surrounding the space of the Dean Street venue. When I began to trawl through look books, business cards, emails and some four thousand photos I suddenly found my photo of a beautiful jacket by Lilah. If you have an upcoming Wedding or beginning to plan your wardrobe for next year, Lilah is your go-to brand for pure and simple elegance. To allow you a closer view of these irresistible pieces, I have pinned everything I have featured to my #shwishlist pinterest board. If you would like to recommend a brand or item, email: moi@sarahhayleyfreelance.com or tweet me with the hashtag #shwishlist.